Ingrown hairs cause bumps and discoloration of the skin. They can also be very painful. Imagine if you could permanently get rid of pesky and unsightly ingrown hairs? Well, you actually can with medical laser hair removal. New York City’s preferred laser hair center offers treatment for ingrown hairs. 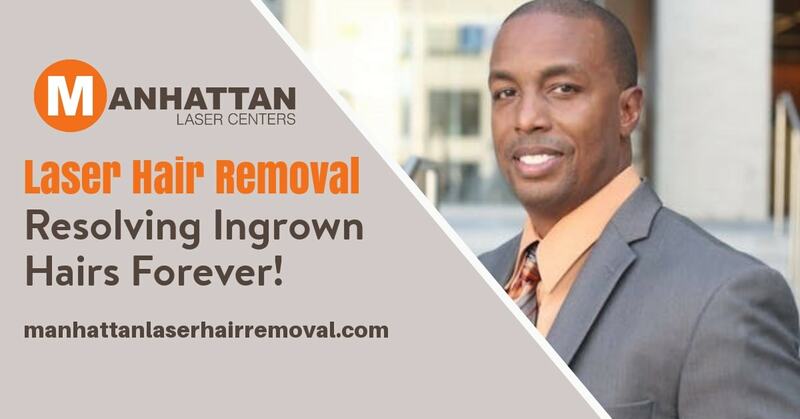 In fact, Manhattan Laser Centers are the preferred provider for ingrown hair treatment and laser hair removal in NYC. First, let’s discuss what actually happens with an ingrown hair. Ingrown hairs result when the hair grows back into the skin’s surface. This often causes a bump and/or discoloration of the skin. It can become infected and collect puss, and often results in a skin rash. Ingrown hairs can occur anywhere on the body and are often caused by shaving or waxing. Ingrown hairs can be treated by medical laser hair removal. NYC offers many “hair removal” studios, but few actually use medical lasers. It is important to use a true medical laser when treating ingrown hair. Laser hair removal of the ingrown hair is often performed in a series of treatments much like traditional laser hair removal. If you have discoloration of the surrounding skin as a result of the ingrown hair, we can help resolve that as well. If you want to permanently resolve your ingrown hair problem, the only effective way is through medical laser hair removal. NYC residents and anyone in surrounding areas who experience this problem can count on Manhattan Laser Centers to provide them with a permanent solution. Don’t continue to live with ingrown hairs. Our staff is highly experienced and our services are very affordable. Schedule your appointment today!